Enter the text you want to be displayed on the Favorites menu for this item. If you leave this area empty, the path entered in the Folder for the Active panel area would be displayed on the menu. Enter the path to the folder you want to be displayed in the active panel when you choose this command from the Favorites menu. If a virtual folder is set up for this area, you would not be able to edit it directly; in this case, use the Browse button (the button next to this area with the dots ... on it) to locate the folder you want. You can also press the X button to reset this folder to the Desktop folder. 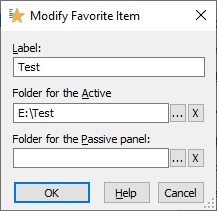 Enter the path to the folder you want to be displayed in the passive panel when you choose this command from the Favorites menu. If a virtual folder is set up for this area, you would not be able to edit it directly; in this case, use the Browse button (the button next to this area with the dots ... on it) to locate the folder you want. You can also press the X button to clear this area; in this case the passive folder would not be set by this command.